Pentecost Sunday and all fired up. On the day of Pentecost the disciples found that they could speak in many different languages. The celebration at Bordeaux for Pentecost could not have been more poignant as the congregation was made up of people from many nations and ‘tongues’. Reverend Bramwell Bearcroft spoke about how the Holy Spirit changes us and how it should be easy to see those whose lives had been changed even if our languages are different. His address was translated into Malagasy by Stephen Razafindratsima and into French by Christine Rychlewski. Stephen also translated the liturgy and the hymns into Malagasy and it was inspiring to hear the congregation singing ‘Thine be the glory‘ in different languages! Meanwhile … the children met in the ‘upper’ (well it is on the first floor!) room with Jennifer to hear the dramatic story of Pentecost … action packed with wind and fire and the Holy Spirit. 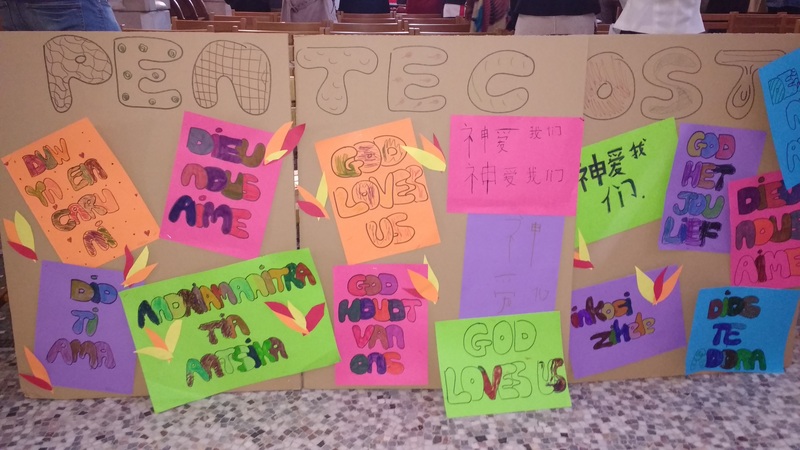 We then wrote out ‘GOD LOVES US‘ in as many different languages as possible … Chinese, Spanish, Italian, Madagasy, Portuguese, French, English and so forth to make a big banner so that we could go out and spread the word as Jesus had commanded. In church later the children shouted out this message in their chosen language (all at the same time!) to make sure the multi-cultural congregation had got the message! PENTECÔTE is always a very special Sunday and it was made even more special due to Bramwell and Jennifer’s presence. 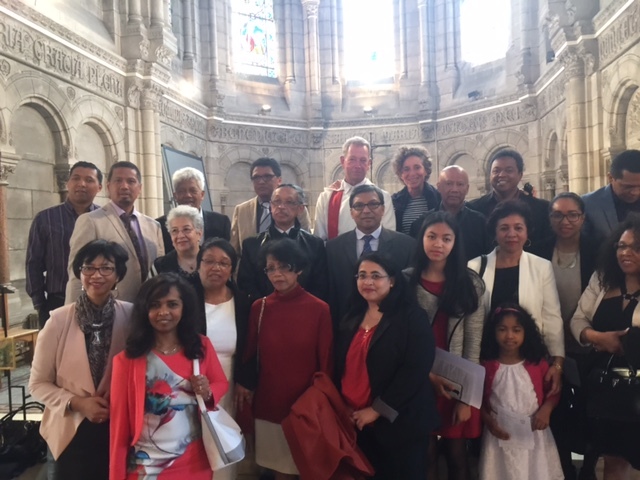 More than 70 people attended the joint service with the Madagascan community, many of whom had travelled all the way from Strasbourg to participate, and thirteen children attended Sunday School. The choir under Richard’s direction provided beautiful music. After the service coffee and wine and finger food were served and thanks to Anne Sharp’s reminder, we all sang Joyeux Anniversaire to Violette Barrau.